Native plants continue to grow in popularity among gardeners, and right now is a good time to plant them so that they can get established before winter. Most people think of their gardens as an expression of beauty; only recently are gardeners considering the impact their personal landscapes have on preserving and promoting wildlife. Native plants provide food and shelter for native wildlife both great and small in a world where both are diminishing commodities. According to University of Delaware entomologist Douglas Tallamy, “Once common species such as the northern bobwhite, eastern meadowlark, field sparrow, and grasshopper sparrow have declined 82%, 72%, 68%, and 65%, respectively, in total numbers, and are completely absent from many areas that used to support healthy populations.” (www.bringingnaturehome.net). Just what is considered native is hotly debated by ecologists and horticulturists. Most define American natives as plants that existed before Columbus came ashore. Here’s where defining native gets more complex. In recent years, plant breeders have carefully selected or crossbred native species of annual and perennial plants to develop new varieties of native cultivars, or ‘nativars’. This has resulted in more choices for gardeners of colors, flower types, disease resistance, sizes and more, but scientists are still studying whether nativars serve the same purposes in the ecosystems. This is the subject of research, but the answer will probably depend on the specific plant and the animals, from butterflies to bacteria, that are dependent on a particular cultivar. 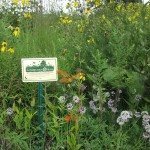 We have a wide range of perennial native forbs (an herbaceous flowering plant), trees, shrubs and grasses representing the diversity of habitats found in Northern Illinois: savanna; open woodlands; prairie and bog. Native plants blooming now or very soon include Sporobolis (Prairie Dropseed), Aster azureus (Sky Blue Aster), Echinacea purpurea (Purple Coneflower) and Rudbeckia speciosa (Black-eyed Susan). You can also find a selection of Natural Garden Natives—a line of locally grown native plants, whose seeds are also collected locally. If you want some native plant inspiration, The Growing Place in Aurora provides it in the form of its Learning Gardens. The Landscape Tapestry garden in the parking lot functions as a rain garden and features native plants mingling artistically with ‘nativars’ and non-natives. The result is a stunning mosaic that is as practical as it is beautiful, perfect for any yard. If a small slice of pre-Columbian prairie is more to your liking there’s the Goldfinch Prairie. Wood chipped paths allow you to get up close and personal among prairie plants that tower overhead while many Goldfinches flitter on the branches. In Naperville, the Embellished Prairie garden offers a more manicured look incorporating natives with cultivars. One thing is for sure, you can support native wildlife by planting native plants and The Growing Place has wide selection and the advice you need to be successful.